Step 1: Open your web browser and type in the IP address of the Firewall (https://192.168.10.1 by default). Enter the username (admin by default) and password (admin by default), and click Login. 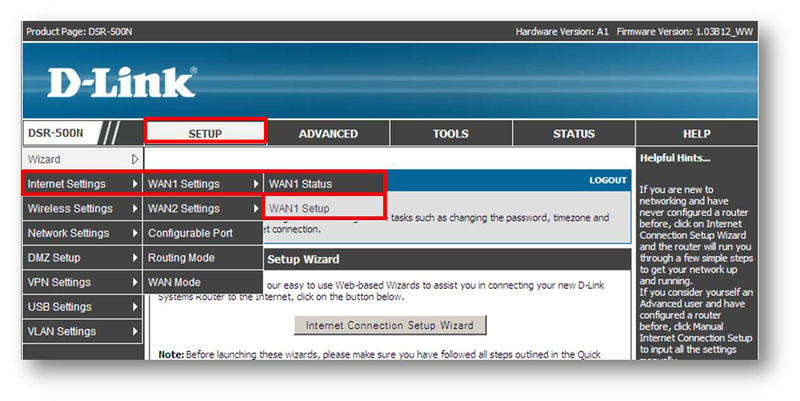 Step 2: Click the Setup tab on the top > Select Internet Settings on the left Side > WAN1 Settings and then click WAN1 Setup. 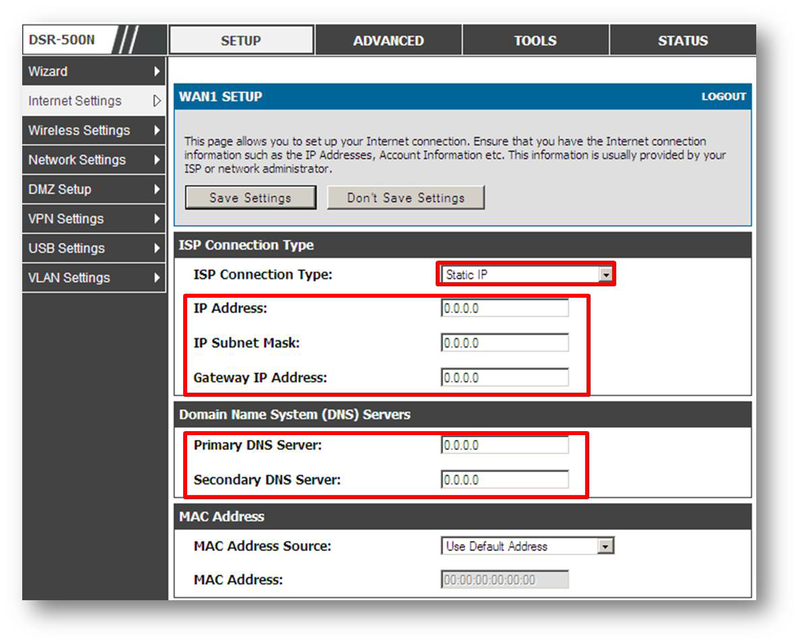 Step 3: From the ISP Connection Type drop down box select Static IP. IP Address: Enter the IP address supplied by your Internet Service Provider. IP Subnet Mask: Enter the Subnet Mask supplied by your Internet Service Provider. 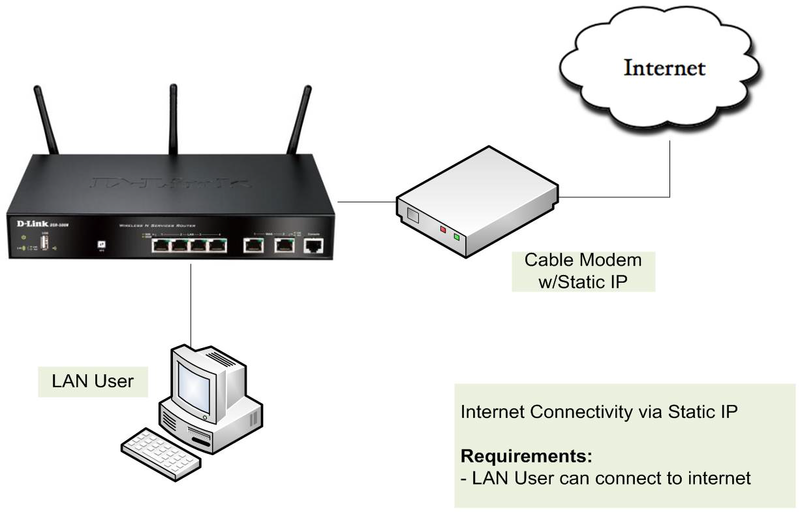 Gateway IP Address: Enter the Default Gateway address supplied by your Internet Service Provider. Primary DNS Server: Enter the Primary DNS Address supplied by your Internet Service Provider. Secondary DNS Server: Enter the Secondary DNS Address supplied by your Internet Service Provider. Step 4: Click Save Settings. 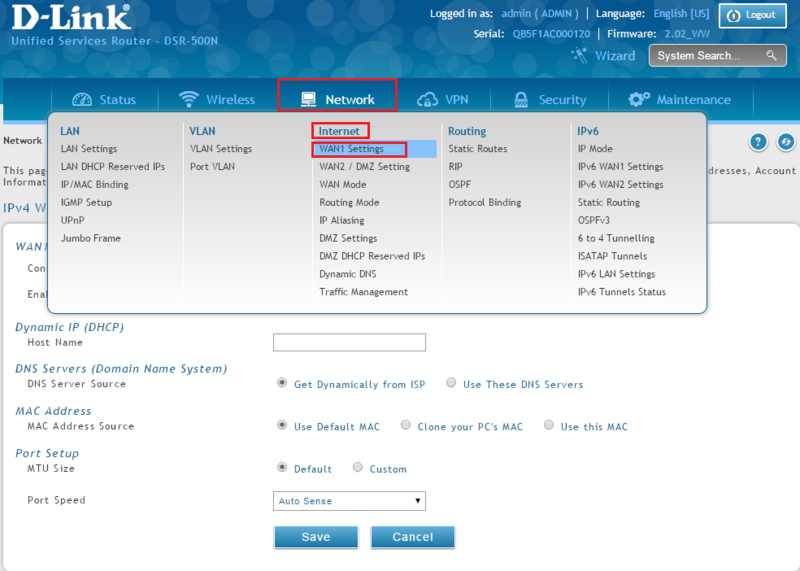 Step 2: Click the Network tab on the top >Internet >WAN1 Settings. 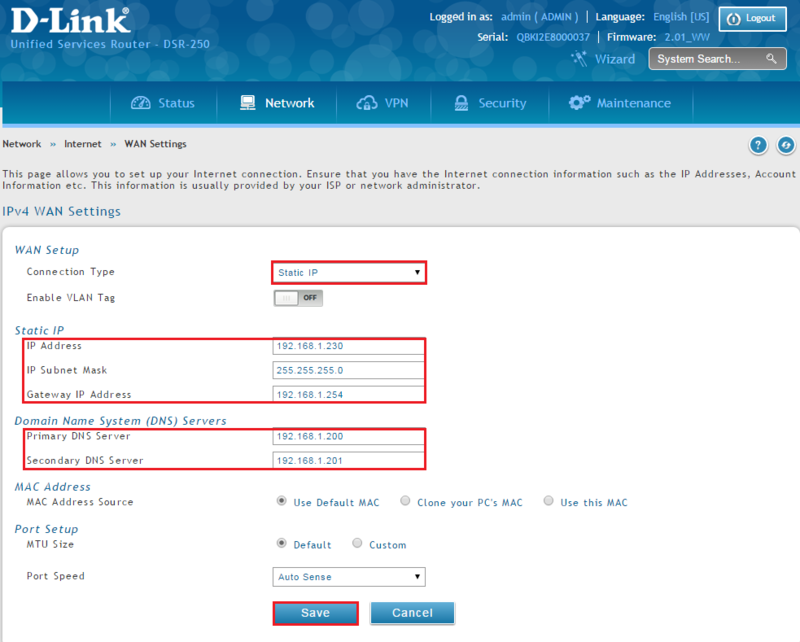 Step 3: WAN1Setup>Connection Type drop down box select Static IP. 1. IP Address: Enter the IP address supplied by your Internet Service Provider. 2. IP Subnet Mask: Enter the Subnet Mask supplied by your Internet Service Provider. 3. Gateway IP Address: Enter the Default Gateway address supplied by your Internet Service Provider. Domain Name System (DNS) Servers. 1. Primary DNS Server: Enter the Primary DNS Address supplied by your Internet Service Provider. 2. Secondary DNS Server: Enter the Secondary DNS Address supplied by your Internet Service Provider. 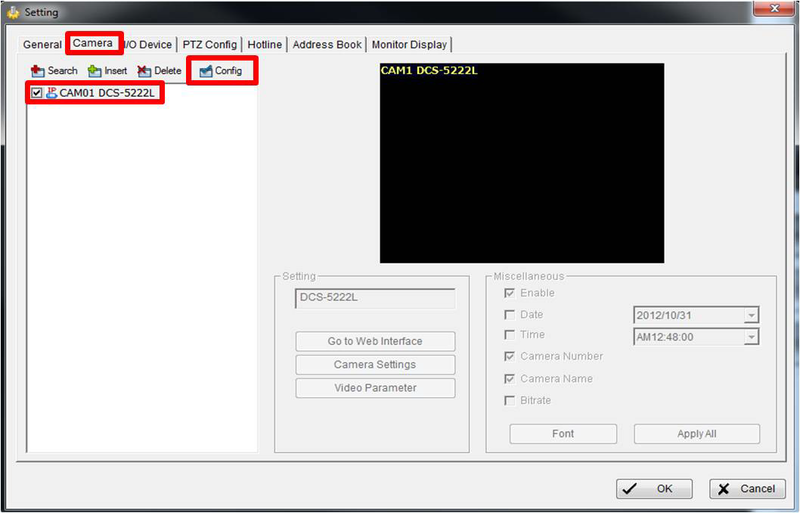 Download the latest version of D-ViewCam as well as the latest Device Pack here. This FAQ only applies to the D-Link DCS-8000LH, 8010LH, 8300LH, and 8525LH cameras. Step 1: Launch the mydlink app. 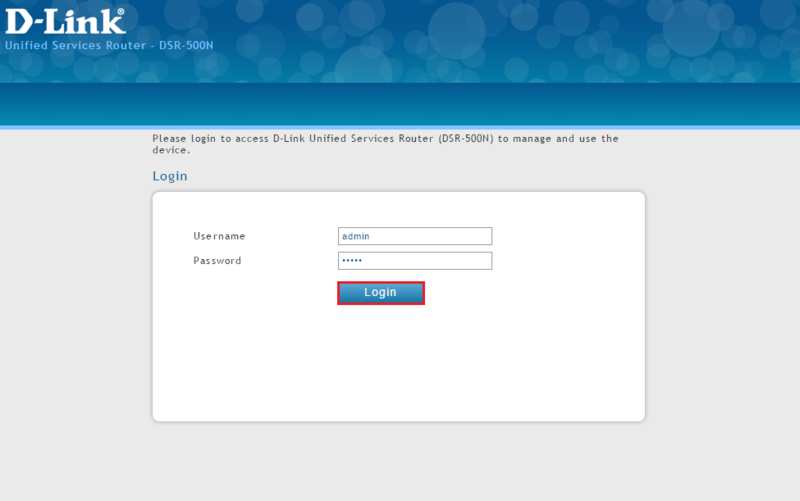 Log in with your mydlink account username and password. This will be the same username and password if you have used the mydlink Lite or mydlink Home app. If you have never created a mydlink account, you can create one. Step 2: Tap the settings icon (3 lines in the upper left corner). Step 3: Select Add a Device. Step 4: Tap Yes to scan the QR code.The QR code is located on the label on the bottom of the camera or on the Wi-Fi configuration card included with the product. If the label or card are missing, tap No and select from the drop-down list. Step 5: If you tapped Yes, scan the QR code. 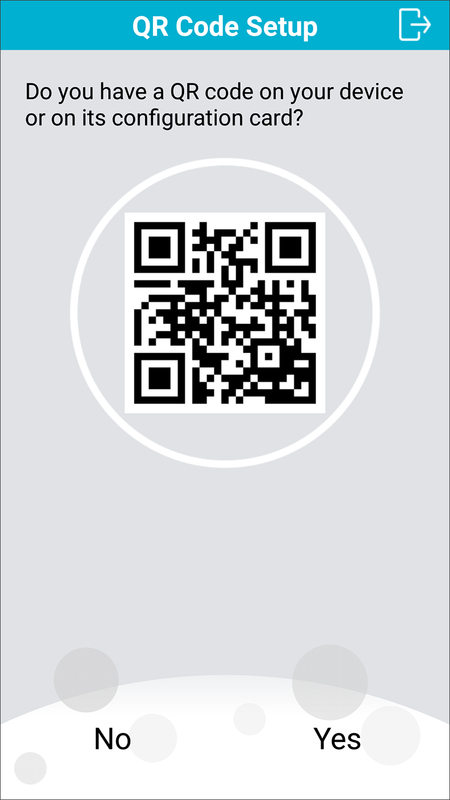 If you are having trouble scanning the QR code, move to a brighter lit area. If you tapped No, select the camera model from the list. Step 6: Tap Next. Please wait about a minute (or less). 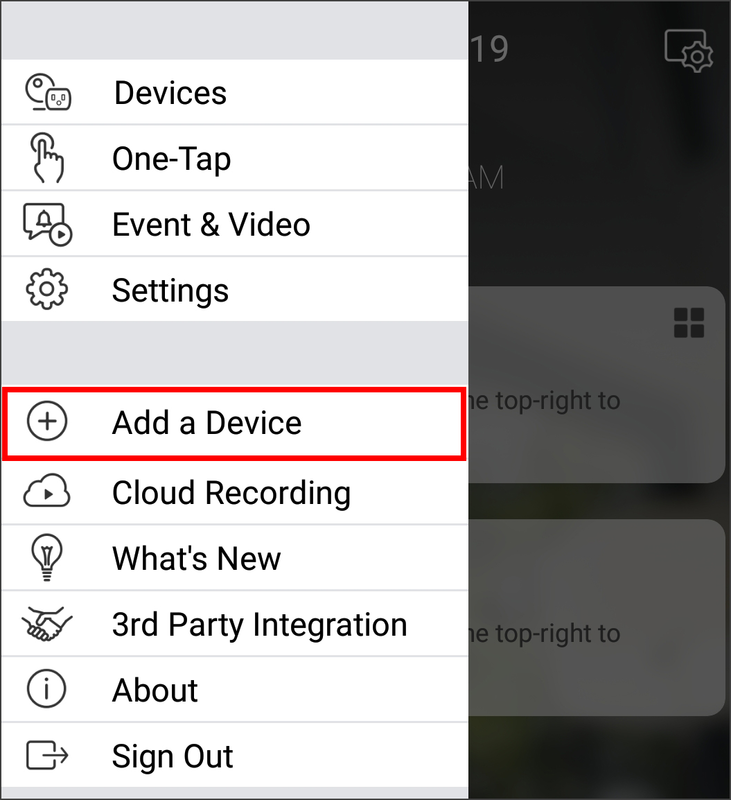 Step 7: Tap Device Location to select where your camera will be setup. Select from the list or scroll to the bottom and tap Add Location to create your own. Step 8: Tap Choose Your Wi-Fi Network. 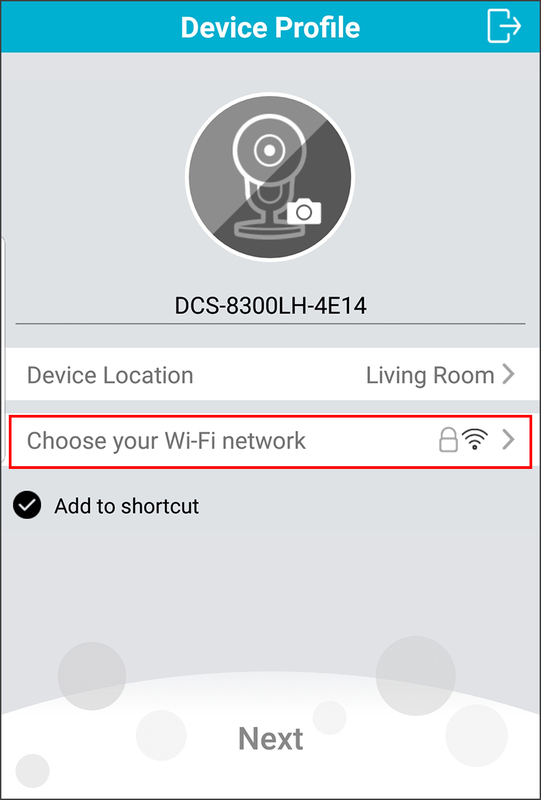 Select the WiFi network you want to connect the camera to (note this should be the same network that your mobile device running this app is on). Enter the Wi-Fi password and then tap Next. Step 9: If you want this camera to be displayed on the “Home” screen, tap Add to Shortcut (checked by default). Tap Next at the bottom to continue. Step 10: The camera will now save your Wi-Fi settings, and then bind to your mydlink account. This process can take up to 3 minutes. Note: If you receive an error during the Setup Wi-Fi process, make sure you are entering the Wi-Fi password correctly. Remember it is case-sensitive. 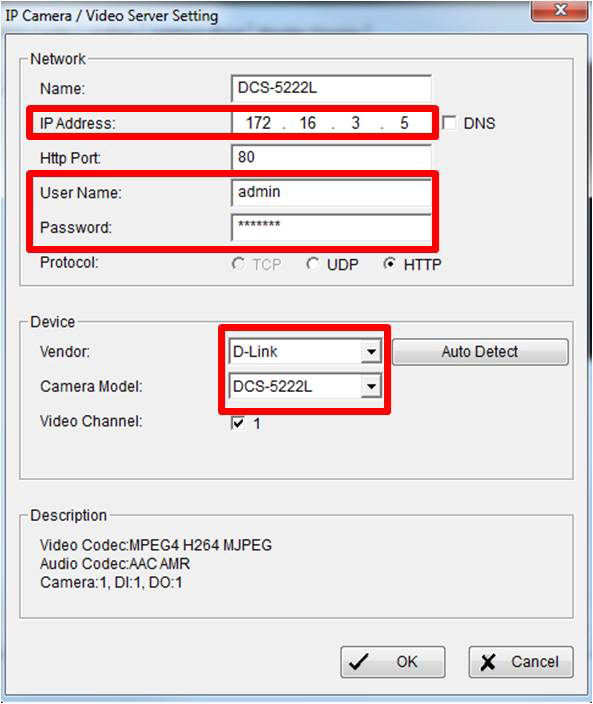 Also make sure the camera is within range of your wireless router, and that the router has DHCP enabled and does not have any filtering which may block the camera from connecting. 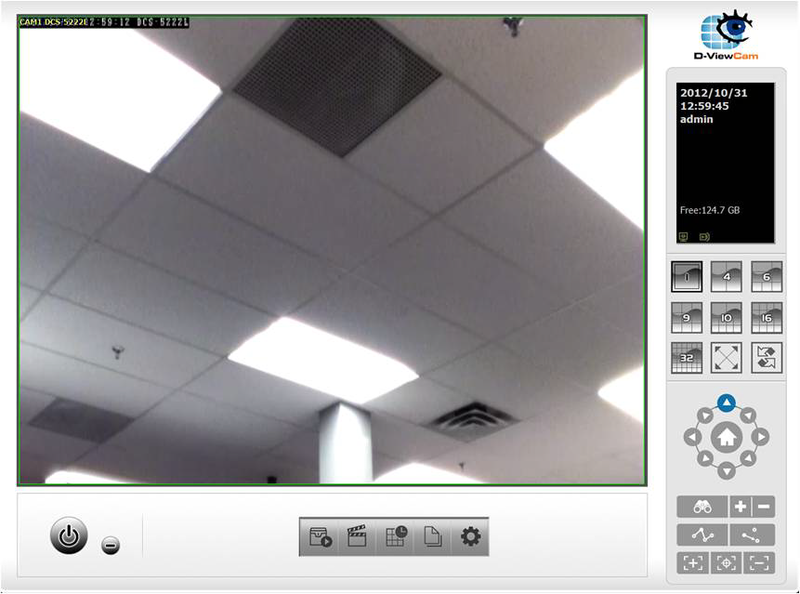 If you receive an error during the Binding process, this usually means the camera cannot connect to the mydlink servers. It is best to reboot your router, close the mydlink app, and reset the camera (hold a paperclip in the reset hole for 10 seconds and release. The LED on the back should turn red). 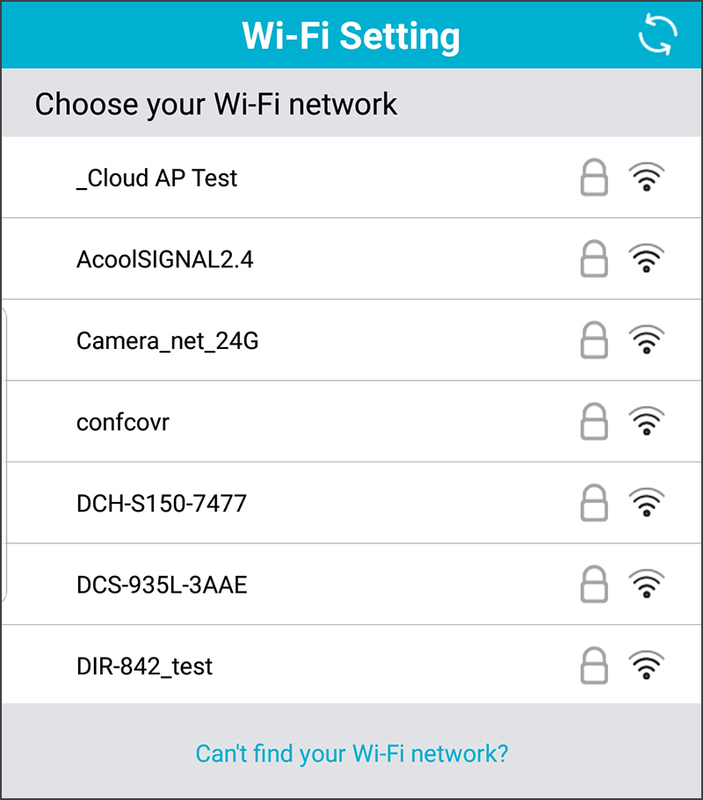 Once your router has rebooted, open the mydlink app and set it the camera again. If you continue to get errors, please contact D-Link support at 1-877-453-5465. Support is free and available 24/7. 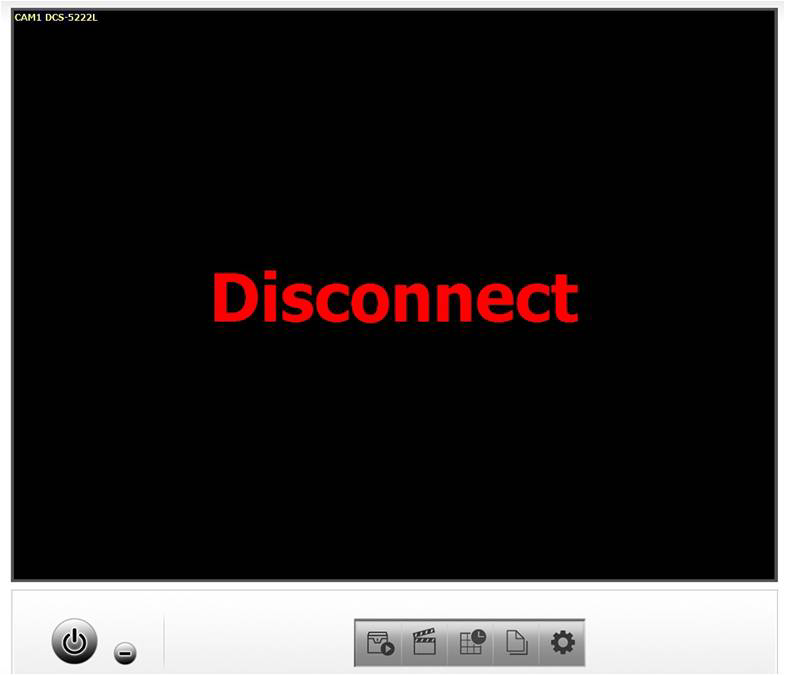 Step 11: Once the camera setup is finished, the following message will appear. 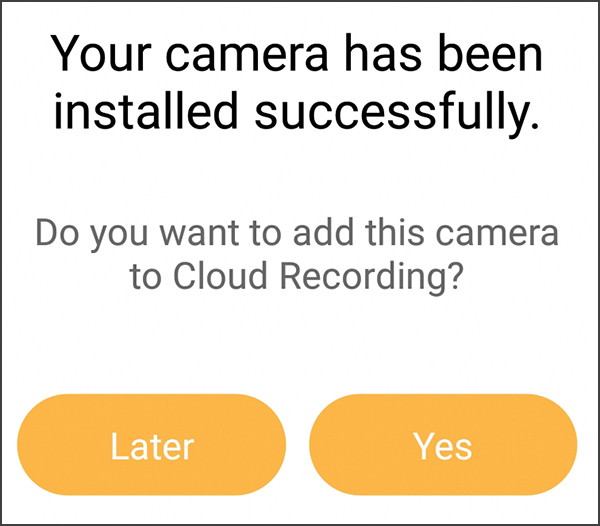 If you want to add the camera to cloud recording, tap Yes, or tap Later. 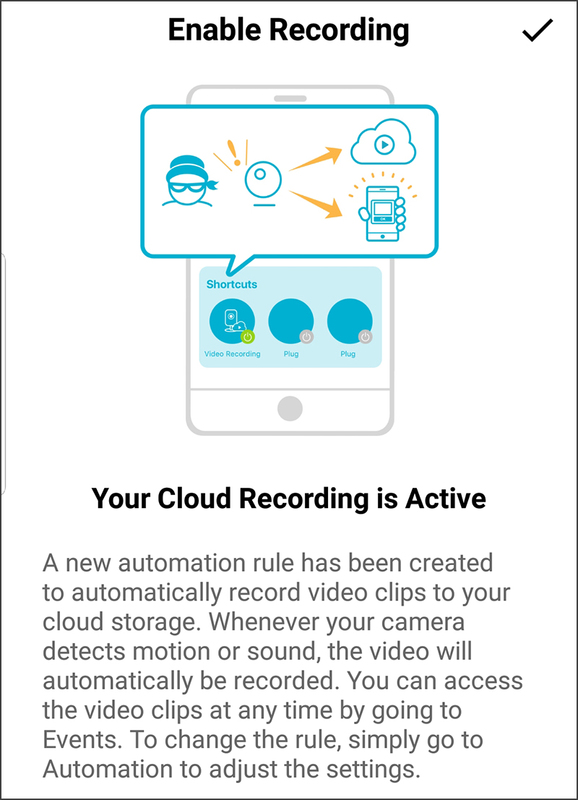 Step 12: If you tapped Yes, a new Automation will be created to record video detected by motion to your cloud recording subscription (free or paid). Tap the check mark at the top right corner to finish setup.